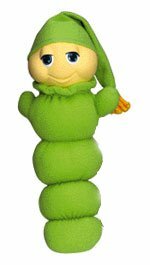 One of those fears that most children go through is a fear of the dark, a fact that didn’t go unnoticed by Hasbro division Playskool when they launched their Glo Worm doll. Glo Worm was a soft toy made from soft bright green fabric with a cheerful vinyl face and a cute little green night cap that also glowed at night. By pressing the body of the doll the face would light up, and therefore was able to comfort young children in a darkened bedroom by providing a soft glow for them to see by. The toy appeared in 1982 and was snapped up by eager parents in the hope that it would help their young ones get to sleep at night, though in reality they probably either lay in bed constantly switching it on and off, or if very young were possibly scared witless when they rolled over onto the toy when close to sleep, thus making its head glow and startling them awake! Glo Worm proved popular enough to launch a range of books, bedside lamps and the like and in 1986 also spawned the Glo Friends, a range of small static plastic figures in various insect shapes that also glowed in the dark. These were popular with slightly older children who liked to collect the entire set. Playskool have since revamped the original Glo Worm doll and the version you can buy today is a little shorter and fatter than the original, and is dressed in what appears to be a blue hoodie with antennae! It’s also suitable for babies and now plays six lullaby tunes as well! This entry is filed under Toys - Dolls and Action Figures	and was posted on August 7th, 2008. You can follow any responses to this entry through the RSS 2.0 feed. You can leave a response, or trackback from your own site. hi just found this site which is great brings back so many memories, how about big-trax the toy, etch a sketch, quattro the drink, chewing nuts & fraggle rock? Welcome Graham, glad we’ve managed to bring back a few happy memories for you! Did you find our search box in the right hand column? Note to self – must make this a bit more prominent! Thank you also for your suggestions – I think you may have given me some ideas for future things to write about! Aw, Santa bought me a glow worm when I was about 6. If you gave one to a 6 year old nowadays they’d probably laugh at you! My 6 year old niece had a birthday last month, and everything was high schol musical. Apparently “Bratz are for babies” and don’t even mention Dora the explorer, who used to be a hot favourite until recently! Sounds like a lot of happy memories returning there! Do you know what happened to Kiki – it sounds like you don’t have her any more. I got a Glo Worm for my son when he was small (around 1983). It is still in good condition but missing the ‘glo’ part. Where can I go to complete the piece? I would like to present the Glo Worm to my son for my upcoming grandson… 2nd generation toy. Sorry Cathy, I’ve no idea where you could get the old Glo Worm repaired. I believe there is a new version of Glo Worm available but it is a bit different to the original one.